← Random Panel: "I don't think that's what Air Male means, sir." 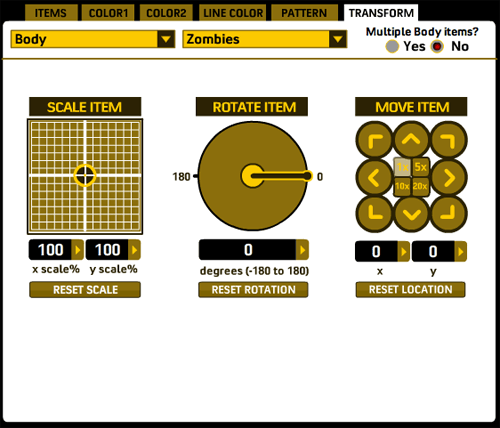 The main addition to the rotate and scale controls is that you can now manually enter values for scaling an item. These text fields also automatically update while you're scaling the character so you can see what the values are. The new kid on the block is the "Move item" set of controls. As you can imagine, clicking the various direction arrow moves the current item in that direction. In the middle of the controls are four "multiplier" buttons, so you can move it either 1, 5, 10, or 20 pixels at a time. Of course you can still manually click and drag items around as you like, with the current coordinates automatically displaying while you do so in the appropriate boxes. "Reset Location" will move the item back to the default starting position for everything in that slot. Still to come on this tab are: grouping controls, so you can (for instance) move/rotate/scale everything in the Body slot all at once; a "reset all" type of button that will reset scale, rotation, and position for the current item with just one click; layering controls; outline options (so you can outline individual items in either black or white -- figuring out how to do that for the full set of colors is a headache I don't need); flipping; some sort of "apply all transformations to ..." button, kind of like the paintbrush in the minis, so you can click on items to apply the current item's scale, position, and rotation. And whatever else y'all think of. I've gotten a lot accomplished this week. Within the next few days I ought to have enough done to start drawing. The first thing I'll do when that time comes, probably, is to convert all the Zombie and Modern Warrior items over. Luckily that turns out to be pretty easy. Before that can happen, though, I need to nail down the little mini toolbar that gets added to the preview box, currently that's just for show. And I also have to get the preview item tab working properly. I'd say with those completed, I'll have the minimum functionality needed to make drawing worthwhile. The rest of the feature set can get added as I go along. Let me know if you see something that looks like it won't be good, or if you think of something I ought to add but haven't thought of yet. I like the scaling values of X and Y, it will be a good added addition when reducing or enlarging an item, to keep it nice and consistent. Oh by the way are you going to be making different sized bodies like a kid and a brick?? Haha!! Just kidding Jeff!! What do work the proportion keeping option ? Dang, I forgot about that. Thanks Fabien, I’ll add that. Question: If I use a bunch of items to jury-rig an insignia, can the jury-rigged insignia be outlined? @Danny: I don’t know yet. I hope so. Because that would be cool. Looks good Jeff. Will the masking feature be in the transform slot? I’m not sure yet where that’s going to live, Frankie. So – how do we volunteer to test the new version? I’ve used HM for many years now – whenever we start a new game the first thing I do is wander over and use it to create my new pic! Is there going to be the ability for us to submit new designs? – and I suppose by extension is there going to be a list of specifications for how to design what you want to submit? @James: No volunteering necessary, UGO will be hosting the beta version in it continuing evolutions live for anyone to access. At least I think that’s the plan. As far as submitting new designs, that’s a very interesting idea. I’ve thought about how to do that before, and I think with this new code base it might just be possible … I’ll need to talk it through with UGO but it ought to be possible. You’d need the latest version of Flash, ideally. Nudging and adding arbitrary value to the transforms is handy. Excellent stuff Jeff – and thanks for getting back to me! Another idea I had (and please tell me when to shut up – I have got far too many ideas – and not nearly enough time to implement ’em!) – is to group clothes / designs / weapons / armour by genre: so – yer fantasy all together, yer cyberpunk all in one place and so on. One of the very few criticisms of version 2.5 was trying to remember where eveything is – in standard? – or in expansion 1? – and so on.